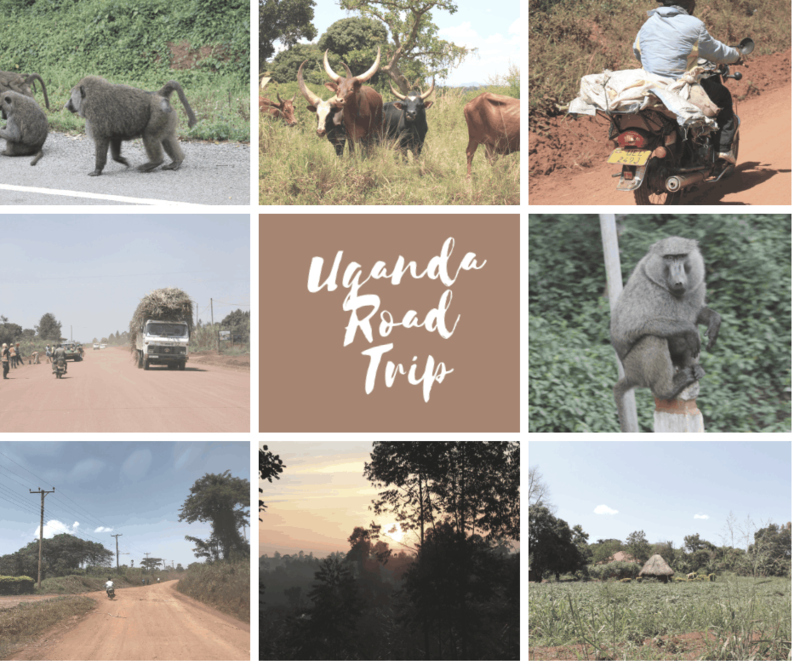 I am exploring Uganda with Everbased Tours. Luckily, they are arranging everything, so I don’t have to worry about a thing! A well organised Tour Company is essential to take care of you and make your Uganda Safari and Gorilla trek a truly special experience. A good nights rest in Kampala was just what I needed before an early start to the adventure! Up early and a long drive ahead to Murchison Falls National Park, stopping at the Ziwa Rhino Sanctuary along the way. The drive is very interesting, watching the beautiful Ugandan countryside as you drive along. Life in the countryside is very different to city life. I am lucky to have a very good driver, Godfrey who drives so well and keeps me entertained as we go! Paul is my tour guide and knows so many interesting facts as well as keeping everything flowing smoothly. The highlight of the Day is the Rhino Sanctuary. Trekking to see these magnificent Rhinos up close is a special, never to be forgotten moment! Standing just a few metres away from this beautiful Mama and 2 month old baby is a bittersweet moment. In the back of my mind I am aware that the Uganda Rhino population was completely wiped out. 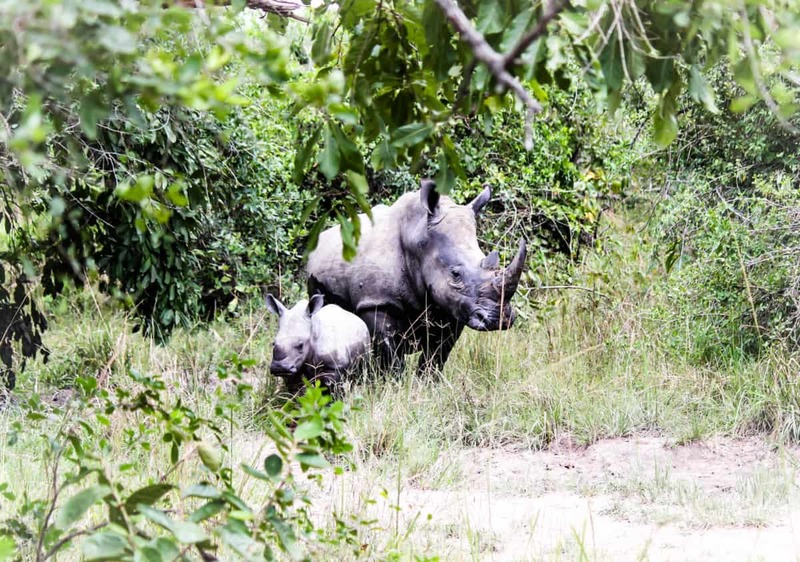 However, thanks to the hard work of the Rhino re-introduction project Ziwa is home to 22 Rhinos. They have to be guarded 24 hours a day by an amazing team of dedicated Rangers. All because some idiots want to hunt these magnificent creatures. The most perfect location! Set on the shore of The Nile… Yes! …. 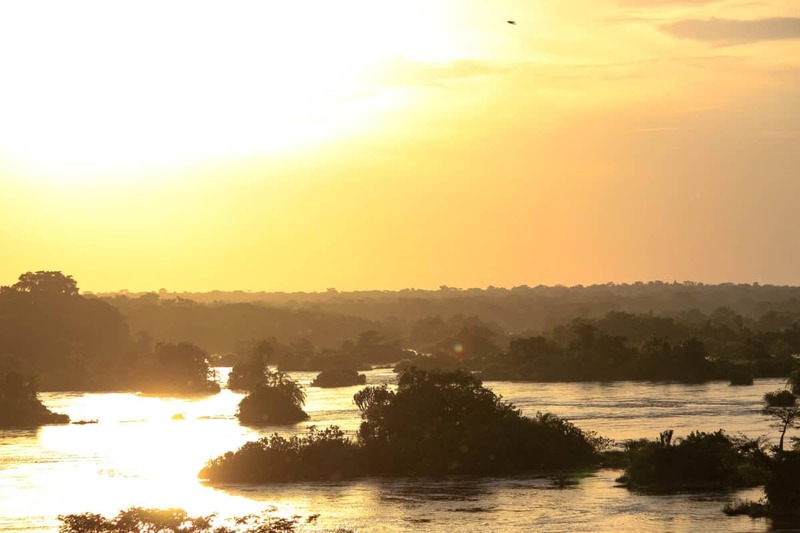 The Nile…. a dreamlike experience in itself. 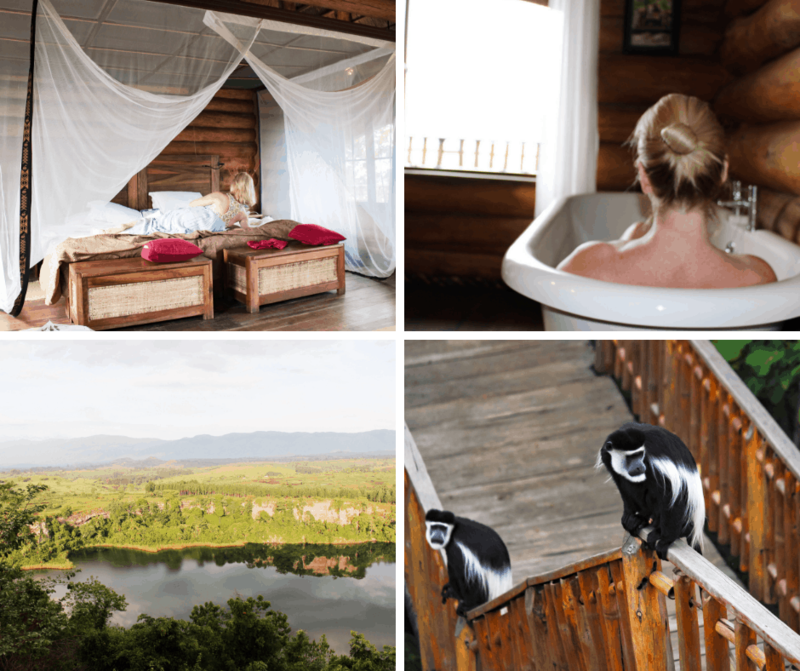 You do not need to move from the Lodge to experience some amazing Wildlife. Enjoy watching the Hippos in The Nile and in the evening they come ashore and graze on the lawn. Murchison Falls National park has incredible array of wildlife. 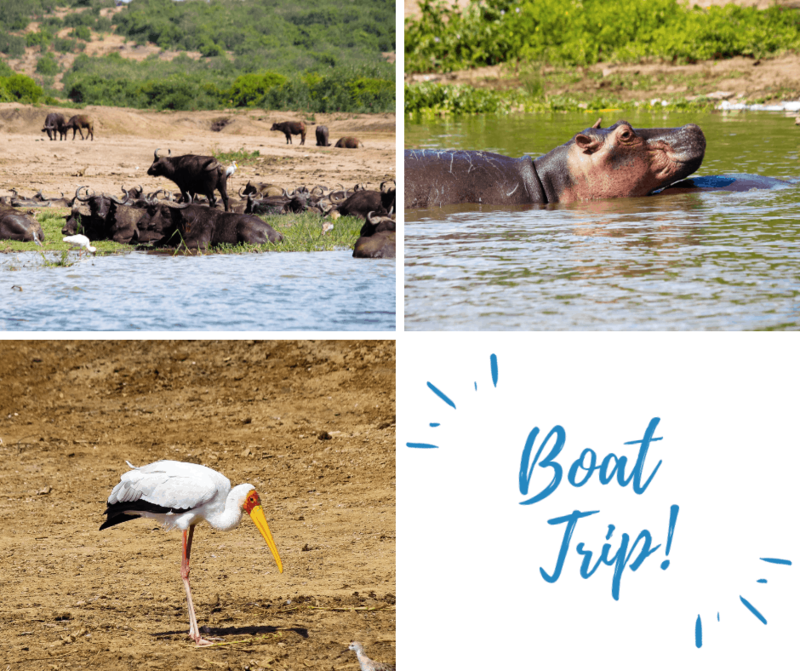 You might be lucky enough to see 76 Mammal species including The afore mentioned Hippos, Crocodiles, Warthogs, Buffalo, Antelope, Waterbuck, Elephant and even Leopard! Bird lovers paradise with 451 Bird species. 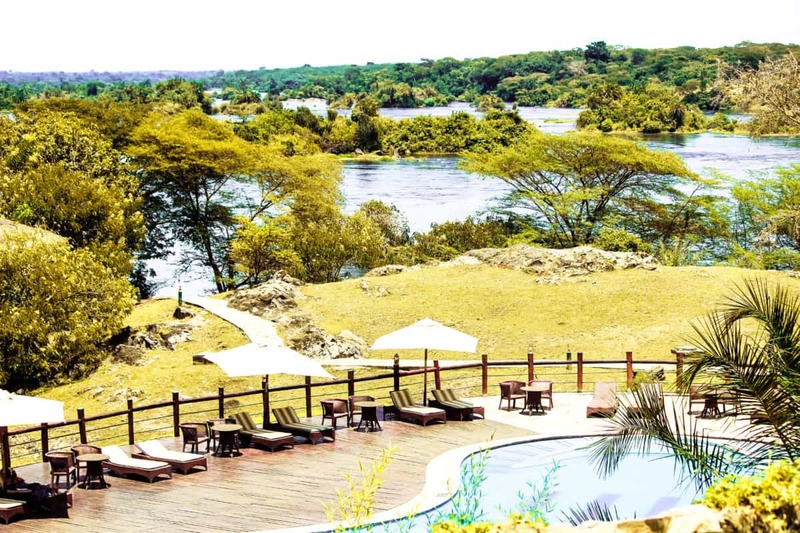 Staying on the shores on The Nile in this stunning National Park was a magical experience! The plan for Day 3 was a Game Drive and Boat ride on The Nile to see Murchison Falls. Another long drive, but interesting things to see along the way. Ugandans are very fit indeed, you will see them walking for miles as you drive along, from little school kids on their way to school to people off to work. Uganda is the friendliest African country I have ever visited. Everywhere you go people are friendly and welcoming. The roads are in good condition with very careful and safe drivers. I felt completely relaxed and at home at all times! My Collage shows a snapshot of life going by …. including the pig on the Motorbike! I will be increasing my donation to WaterAid after seeing too many children carrying water cans long distances. I arrived at Kyaninga Lodge after dark, but what a treat! A magical newly built Lodge that was a favourite instantly. Well done Ever Based Tours for this excellent choice of Lodge. Super comfy Lodge with spectacular views and monkeys outside the window! Does it get better than this on Safari? A morning to relax and enjoy the Lodge and walks then a drive to Hot Springs followed by a second night at Kyaninga. Delicious food too! 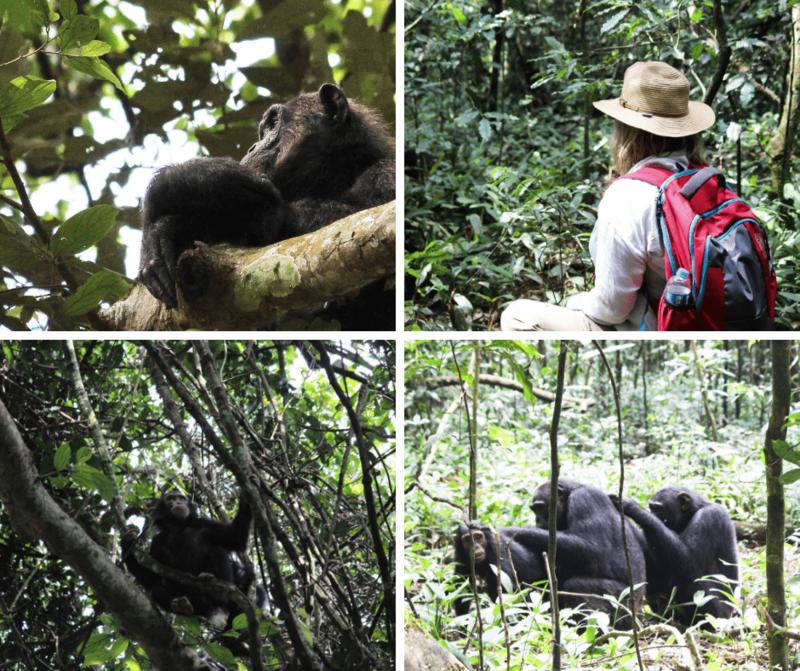 The trek was not long, under an hour and then a magical time spent watching the Chimps. They were up in the trees and quite difficult to photograph and then the Ranger took us to see some playing on the ground. We were a group of 6 for the trek plus a Ranger, wonderful experience and totally worthwhile. There are twelve other Primate species in Kibale which you might be lucky enough to see, including the Ugandan Red Colobus. Baboons play along the roadside to keep you entertained as you drive along! Then we set off for Queen Elizabeth National Park, crossing the Equator on the way, to continue our Uganda Safari. 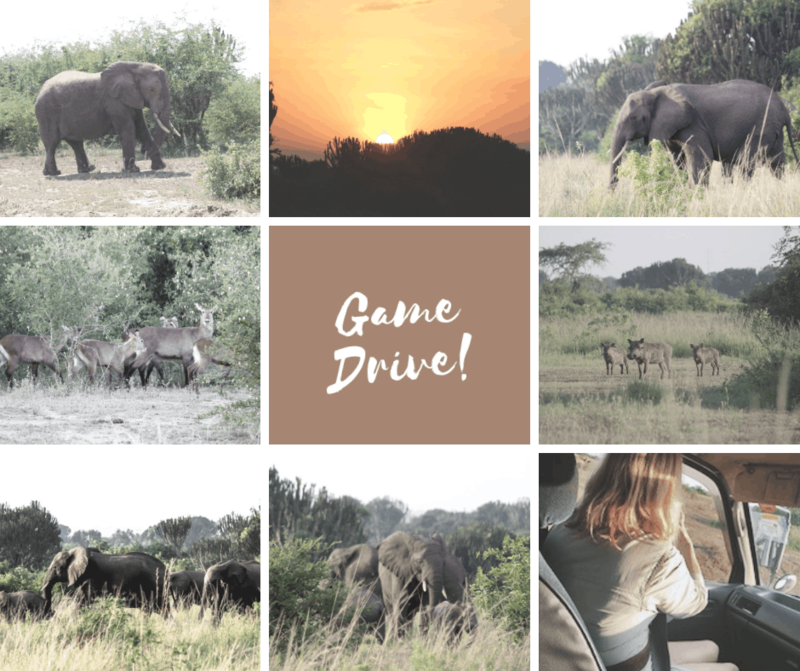 Up bright and early for a Game Drive in Queen Elizabeth National park, spotted lots of elephants, Warthogs, Buffalo, Bushbuck …. Return to Mweya Lodge for lunch, sunbathing and swimming followed by a fantastic boat ride! 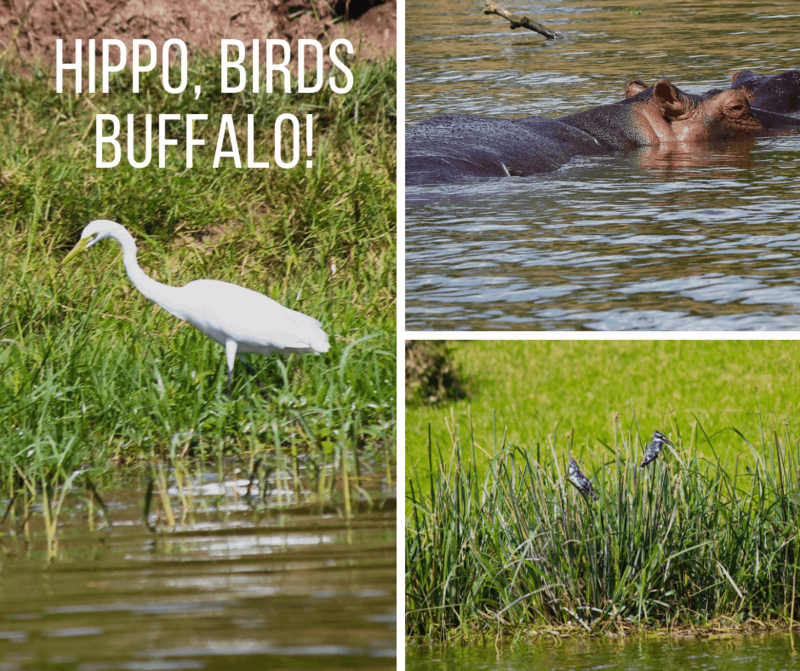 Hippo, Birds, Buffalo. I watched the Elephants bathing while having my breakfast but they had retreated to the shade by the time of the boat trip. The boat was unbelievably close the the Hippos, such an incredible experience. Another delicious meal that night. All of the food has been very good on the trip, from hearty breakfasts to 3 course dinners and great picnics. 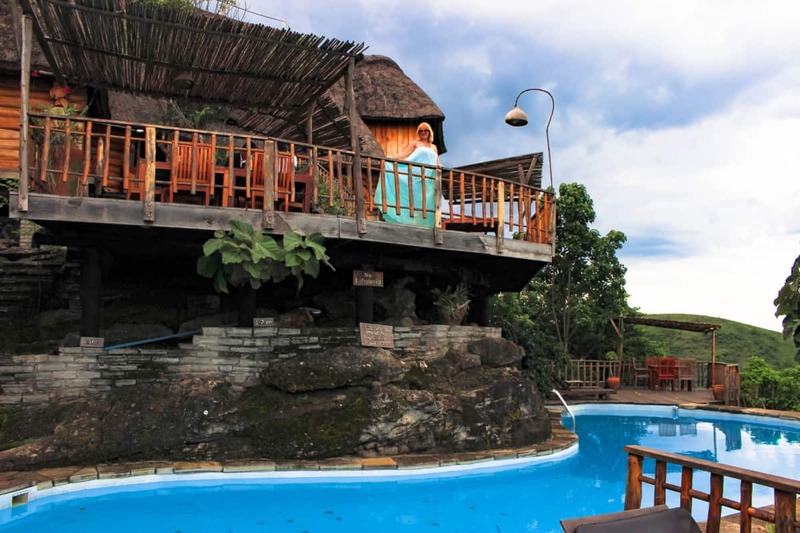 Sit by the swimming pool and watch the Elephants bathing …. it doesn’t get better than this! I really missed TV and WIFI in the Lodge bedrooms. None of the Lodges I visited had WIFI in the rooms, only the public areas with insecure connections. But, this is a small point and I’m sure most people like to get away from it all. I mention it because I would recommend buying a SIM card in the city. 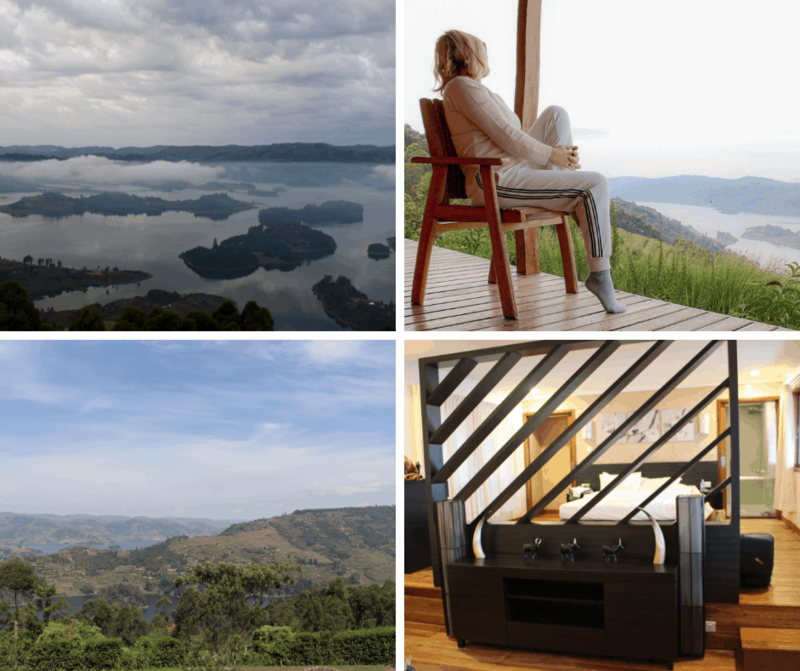 A long full day drive to reach Bwindi Impenetrable National Park and the reason I decided to Visit Uganda ….. The Mountain Gorillas! Enjoy spectacular views driving up into the Forest at an altitude of 2,600 metres. Read all about my Gorilla Trek in detail and with some information too. I want to give you as much information as possible and so it is in a dedicated blog. I just loved my enormous Chalet, brand new, spacious with huge bath and Shower. How about waking up to these views! The Main building with the restaurant was not quite as new and modern but the Chalet was perfect. A full days drive of 8 hours back to Kampala, overnight sleep in a city hotel and EverBased Tours transferred me safely to my flight home. What a trip! I organised my Visa for Uganda online. You will need to have a Yellow Fever Certificate to obtain a Visa. Yellow Fever is now a lifelong Vaccination, as long as you have the certificate or batch number (obtain from your Doctor)Bring a copy of the Certificate with you plus Passport size photo. Malaria Pills: Obviously take your Malaria pills as prescribed, although I didn’t see a single Mosquito for the entire trip. The cost for the Gorilla trek is $600, you will need to organise this well in advance. EverBased Tours arranged this for me. 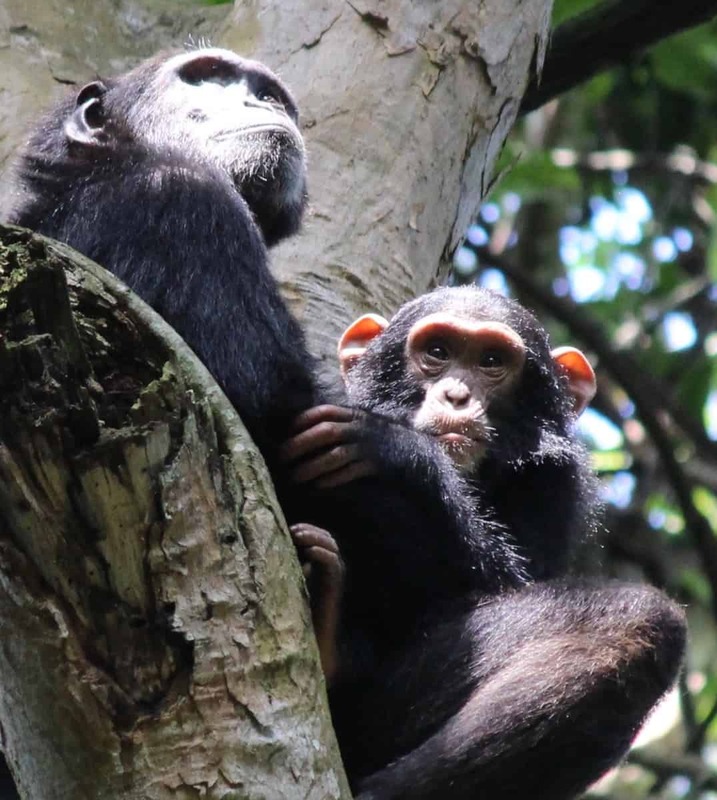 Chimpanzee Trek costs $150 and again you need to organise well in advance. Numbers are limited. Buy Uganda Shillings when you are at Entebbe Airport, although U.S Dollars are welcome for tips. Buy a SIM card when you arrive, WIFI is not great and only in Lodge reception areas. I recommend Everbased Tours to you. They are professional, well organised, have safe drivers and safe vehicles. The staff are also professional, fun and very kind. They will ensure your trip is a trip to remember for all the right reasons! They are members of the Uganda Safari Guides Association, USAGA. Any questions, send me an email. I am always happy to give any advice. EverBased Tours will Tailor Make the trip for you, whether you have one day for an adventure or a long trip around the country. 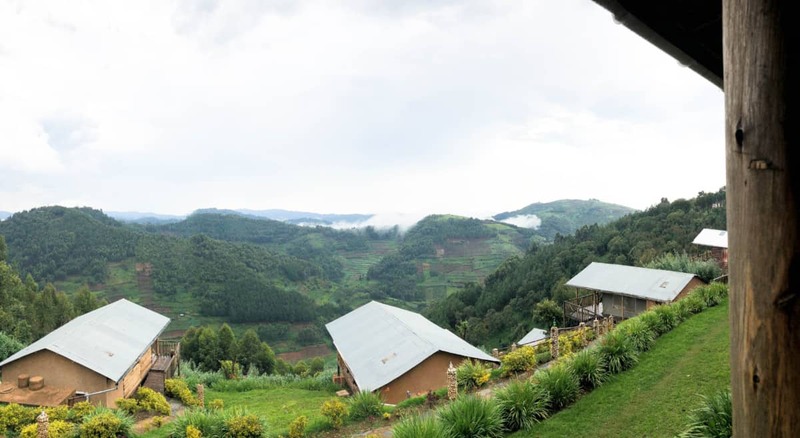 We offer:Gorilla Trekking Safaris in Uganda and Rwanda,Chimpanzee Tracking safaris,Wildlife Safaris,Birding Safaris,Cultural Tours,Hiking Safaris,Honeymoon packages,Group tours,School tours among others. 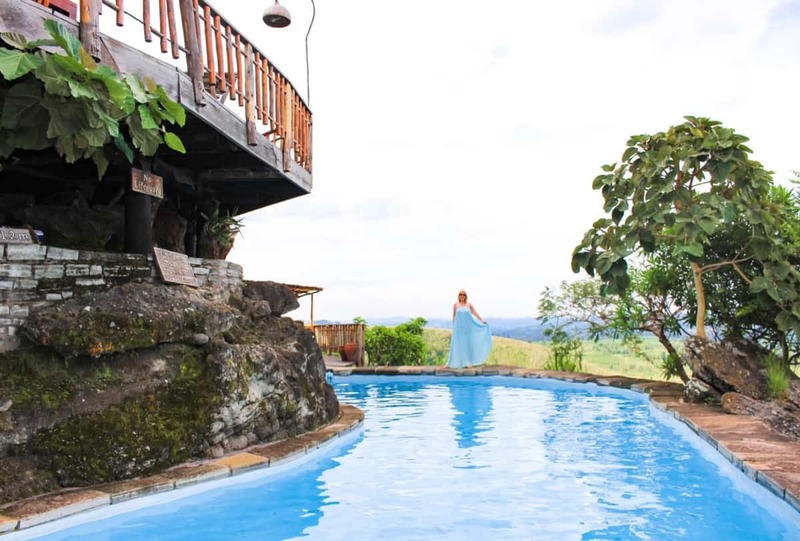 We also deal in air ticketing and reservations,hotel booking and reservations,we also provide accommodation services with our home away from home fully furnished boarding house. Ever Based Tours and Travel Ltd also offers a fleet of customized vehicles(car hire services) for tourism for all categories of clients: Budget clients, mid- range as well as luxury clients. 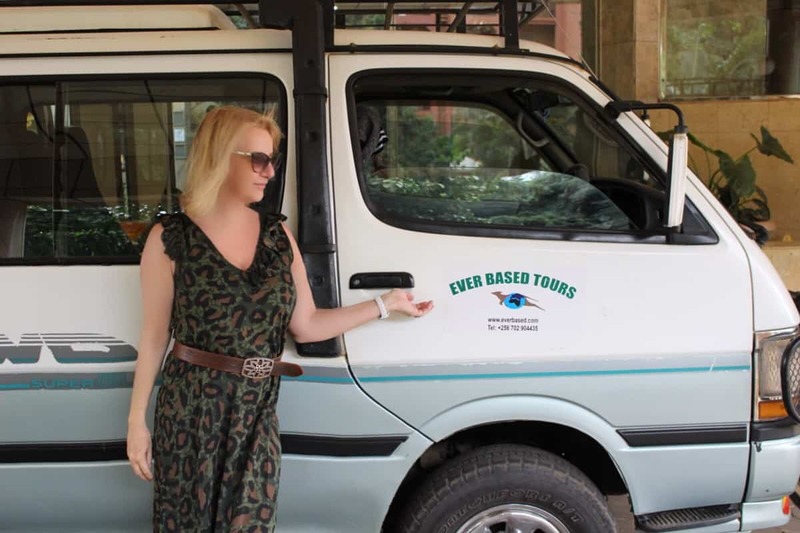 Ever Based Tours and Travel Ltd has been offering these services for the past 12 years, and with our experienced staff,we believe we are the best company to do the job as our motto states “Customer satisfaction is our pride”. Previous Post 5 Reasons to Visit Sri Lanka – and more reasons to revisit!